I am subscribed to loads of blogger’s newsletters and there are some things that I think is really important in newsletters that we don’t talk about all that much. How do you create readable email newsletters? And how do I make a newsletter beautiful? This might sound strange but there are email newsletters that are just a big block of letters. Just to be clear this is not always bad, but there are just some pointers that I think are very important. When an email letter looks boring (or like spam) I am much less likely to open it. And if I do open it and it is just a block of letters I might not read it still. 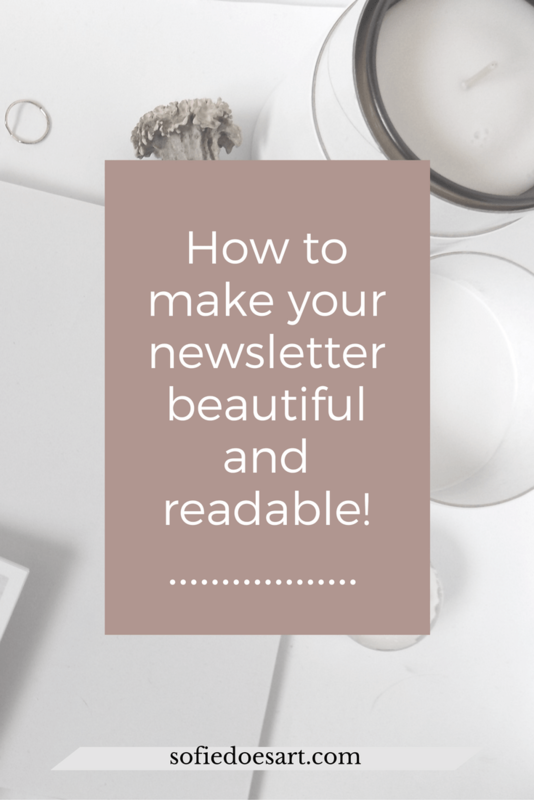 Firstly why do I think making newsletters readable and beautiful is important? I am definitely not an email marketing genius. But I am a serial email newsletter follower. I love exciting titles, freebies and when someone says “actionable tips in your inbox” I am sold. But when I am subscribed it often gets obvious within a few weeks if I will stay subscribed or open your email. Of course, there are the obvious reasons like if the titles aren’t exciting and sometimes I just didn’t need the actionable tips on keeping my orchids alive because I don’t have any. But as a quite visual person, I also do take in account which emails excite me. If they include buttons and pictures and freebies and exciting typography I will probably keep opening them a lot. Make sure your header shows who you are. Since I am subscribed to quite some people I don’t always recognise names but I do recognise brands, logos and colours. So for all those people who send the emails under their own names please include a header that lets me recognise you. Break up the bigger blocks of text. Sometimes I get these emails that are just one block of text. Often over 300 words and the only blank lines are between the hi and the bye. If you have a blog you know that readability is a very important. Don’t just throw out all those great tricks you know just because you are writing on a different platform. If you want to go really fancy adding headings, coloured titles and such is even greater. If I know I can scan your newsletter I will be a lot more likely to open it! Visuals are still important! Of course, some people have a lovely letter kind of format that needs no additional visual content. These formats are amazing and obviously, don’t need pictures. But especially when you are making a sales pitch, I love to see your product and lovely graphics. It makes me excited to check it out and it’s a great sneak peek. Everybody loves a nice picture! I love to support the people that I subscribe to. But I get so much content, that I do cherry pick my best picks. And if I know your emails are exciting and readable I am much more likely to open read and support your emails. Don’t make it too hard on your subscribers! Again we want to support you! I know many of these seems very obvious but like I said I am subscribed to many newsletters and these were just some things that stood out to me. Of course, I also get loads of beautifully designed emails. And I still have a lot to learn about design, email marketing and all those things. So help me out and let me know; what makes you open an email newsletter? Great ideas here, thank you for the tips I definitely learned a few things. One thing that my animal rescue does is we put a little emoji type paw print in the subject line. So when you see an animal rescue news letter, two little red paw prints also draw attention. That has really helped I think. Anyways, thank you! That is such a great idea! I would definitely open those. Thank you for sharing, Demi!